Re-running this photo from late 2015. A remarkable view from a remarkable place. Like people all over the world, I was horrified to see it burning, but heartened to see what still stands and hear the ground-swell of support for rebuilding. 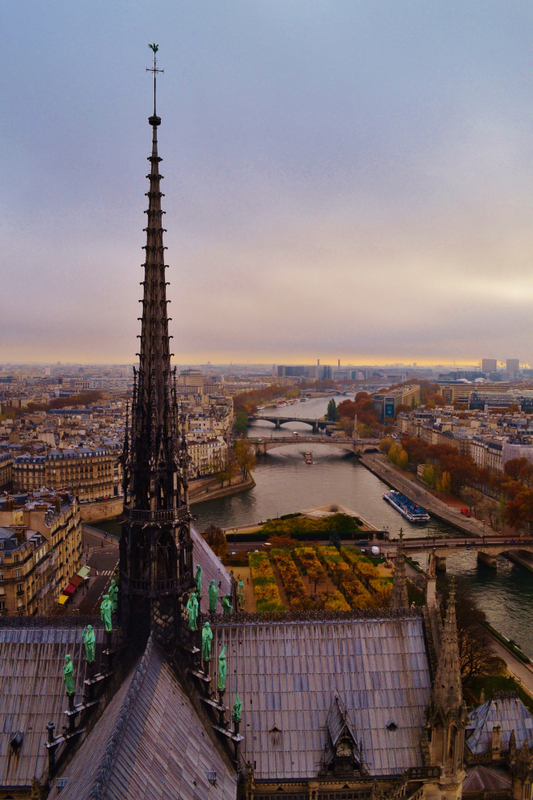 Notre Dame represents divine inspiration, but also the best of human spirit and human effort. What allows some people to escape their demons while others can’t shake them off? What mad inertia drives some, demonstrably resilient, people straight over cliffs to their destruction? I guess there are thousands, millions of individual answers to that question. I had a moment with Zelda and F. Scott Fitzgerald the other week, wondering if they might whisper something, inspire some insight, as I stood by their grave with a meager offering of flowers. Wondering how things went so terribly wrong this side of paradise (although some of the answers to that question are blatant), but also wondering if things look remarkably different (and if there was any wisdom that they could share) from the other side of paradise. I was met with little more than a cold March breeze and silence, but for the low hum of the roadside just beyond the graveyard. Until . . . I turned my back to leave and a swirl of snow flurries began to fall. Not forecast, not expected, and not entirely welcome in March, but altogether beautiful. And this was my farewell from the Fitzgeralds. They were a puzzle to the end– and even beyond– but, by God, they had style. And it seems they have it still. The stone at the foot of the grave, engraved with what is likely Fitzgerald’s most famous passage, from the end of The Great Gatsby. Zelda and F. Scott Fitzgerald are buried at St. Mary’s Catholic Church, Rockville, MD: a very old church around which a modern sprawl has grown. The graveyard sits atop a busy intersection– a major artery in the morning commute into DC. Despite that, it feels quiet and respectful. The Fitzgerald headstones are set back from the road, close to the old church building, so they enjoy one of the more serene spots in the cemetery. And “serene” well describes the moment I lingered over this gravesite– if it doesn’t describe the Fitzgeralds’ lives in the least. Their lives were too often consumed by mania– in Zelda’s emotional state, in Scott’s unquenchable thirst for alcohol– but their final resting place is peaceful. Its background music may be the rumble of the road and the back-and-forth and here-and-there frantic energy of the ambitious, but this small plot seemed impervious. I paused a moment on a Friday morning, I placed my flowers and bowed my head briefly, and I raised my head again to find that snow flurries had appeared out of nowhere. Within minutes, the sky grew heavy and the swirl picked up. I moved on, eager to make use of the free morning I had, wary of what unforeseen storm might be blowing in to disrupt my plans, but also delighted at the beauty of the unexpected swirl and sudden cold. I jumped in my car and headed out into the Rockville Pike traffic, a boat against the current, but moving nonetheless. 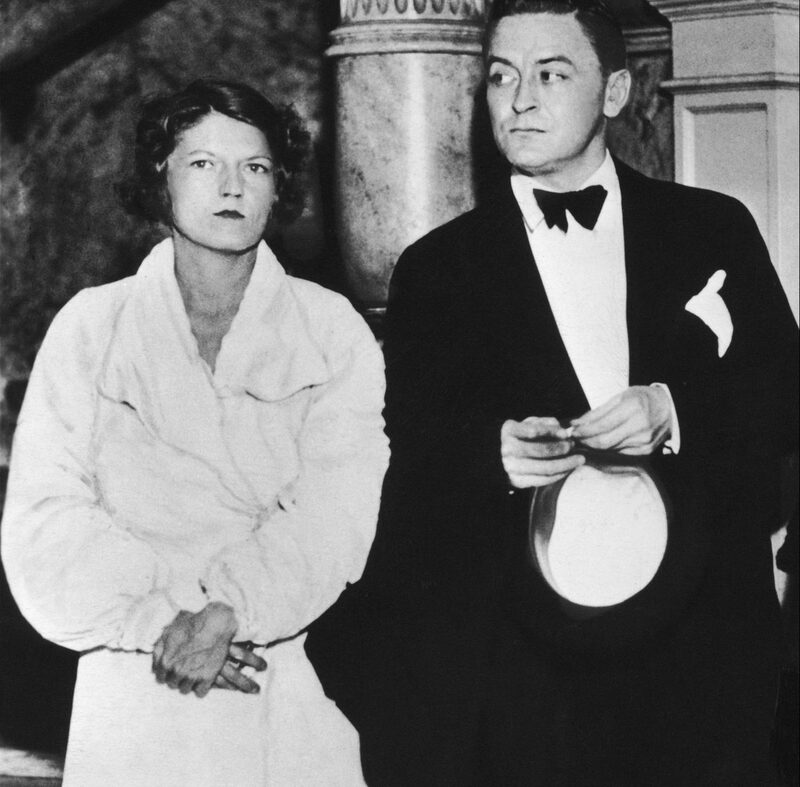 The Fitzgeralds attend a formal event, circa 1935. Obviously, they didn’t actually burst into my room and party the night away. They were, however, very loud inside my head. They kicked about and chatted away and both charmed me and bothered me in the unsettling way that senselessly tragic stories bother me. 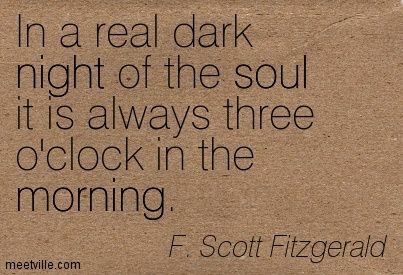 If you’re asking yourself why the Fitzgeralds would descend upon my sleep-adled brain and refuse to budge for hours on end, you’d have to ask them. I will cop to having more than a passing fascination with them, but less than an obsession. They’re a puzzle to me–a tangled mess of talent and tragedy, of what might have been and what was. They’ve always been stowed in my pocket– fellow travelers, entertaining raconteurs, rather rude house guests (as they proved last night). Every now and again I take them out and have a gnaw at them. Lately, they’ve been emboldened though. I suspect this is because I pass by their gravestones frequently*, and when I pass I often think of them. I never stop to visit. I always think that I should. I plan to do it some day. Maybe next week, I tell myself. Or when the weather is nicer. But I never do. So, guess what? They’ve come to me. That’s one way to do it, I suppose. I’m a little worried that they’ll start showing up frequently. I think an excorcism is in order, by way of a visit to their graves– flowers in hand and apologies for having been a stranger so long. I do have a couple of hours free tomorrow morning, and if the sun shines bright and the chill breaks . . . maybe I’ll pay that visit and report back to you. *Where are they buried? In Rockville, MD, as unlikely as that may seem. Scott grew up in St. Paul, Minnesota and came East; Zelda was from Montgomery, Alabama. Scott had a long family history in Maryland, though, and when he passed away at the age of 44, from a heart attack and years of alcoholism, he was brought to Maryland to be buried next to his father. Unfortunately, the priest at St. Mary’s Church refused to allow Scott a burial there, as he was not a practicing Catholic. He was buried in a nearby protestant churchyard, by a minister who had never heard of him, in a service attended by only 20 or 25 people. “Show me a hero, and I’ll write you a tragedy,” he once wrote. He knew the story arc well. But years later, and after her mother had also passed in a tragic and early death by fire, their daughter petitioned St. Mary’s to allow her parents to be moved to the family plot there. This time, it was allowed. It’s a happier resting place than what went before, but still an odd fit. St. Mary’s is an old church, but the church grounds now sit on the edge of a monstrous intersection that is a main thoroughfare for morning commuter traffic into Washington, DC. It’s tucked between apartments, shopping strips, and a large Metro station. I say it’s an odd fit, but, you know, I wouldn’t be the least bit surprised to look up one day, as I motor by, and see the eyes of Doctor T J Eckleburg looking down on me from a billboard above that very spot. Nobody escapes the judgement of those eyes. Not fleeing from a jazz joint, not laid to rest by the roadside in Rockville, and certainly not on a daily commute to and from our nation’s capital. This morning, I was tinkering with a partially written (but long ignored) post from a trip to Nashville in 2017– wondering if it was worth reviving, completing, and posting. Somewhere into this thought process, somewhere toward the bottom of a cup of coffee, as I was figuratively walking away from that post– leaving it once again in blog-post-purgatory– the universe began pelting me with spitballs, each one hitting me with a ping that whispered “Nashville.” So, yes, that post will pop up some day. But first, I bring you a little info of note– the spitball that hit me right in the eye/the delicious morsel of Nashville trivia that popped up, unbidden but perfectly timed, in my news feed this morning. On this day in 1969, Bob Dylan and Johnny Cash recorded an album. It was never released. Bob Dylan and Johnny Cash. Recorded. An. Album. Together. And it was never released. So, there you go. A random post, but too shiny a nugget to throw back. Bob Dylan and Johnny Cash recorded an album, and, if you are resourceful enough, you might be able to scare up a few tracks somewhere. Cash and Dylan, and their rough around the edges but pure poetry music, is too good let lie in silence. A celebration of Prague: my photo and Madeleine Albright’s words (from her book Prague Winter). “On a hill in Prague there is a castle that has stood for a thousand years. From its windows one can see a forest of gilded cupolas and baroque towers, slate roofs and sacred spires. Visible too are the stone bridges spanning the broad and winding Vltava River as its waters flow northward at a leisurely pace. Through the centuries, the beauty of Prague has been enriched by the labor of artisans from a plethora of nationalities and creeds; it is a Czech city with a variety of accents, at its best in spring when the fragrant blossoms of the lindens burst forth, the forsythia turns gold, and the skies seem an impossible blue. The people, known for their diligence, resilience, and pragmatism, look forward each winter to when the days lengthen, the breezes soften, the trees regain their covering, and the river banks issue a silent summons to play.” Madeleine Albright, Prague Winter.